Molisch test is a qualitative test for determining the presence of carbohydrates in a solution.It is named after an Austian botanist “Hans Molisch” who discovered this test for the presence of carbohydrates. It is a general test for the presence of carbohydrates and is positive for all kinds of carbohydrates which in free from or in combined form. For detecting the presence of carbohydrates, the solution is first treated with a strong acid.This is for hydrolysing the carbohydrate to monosacharide.When water is removed from monosaccharides, a compound called furfurol is formed.This furfurol is condensed to form a violet ring or other colored compound.The compound furfurol is condensed with alpha nephthol or other phenol present in molisch’s reagent. Molisch test is very important because it is a general test for the presence of carbohydrates.It is used widely as compared to other tests because before every specific test for different carbohydrates a general test is important and that general test is performed via molisch test.Another important thing is that, this test is positive for all types of carbohydrates whether free or in combined form like glycoprotiens,glycolipids etc. If you want to find the presence of carbohydrates in a given solution then just follow the below procedure of molisch test and you will find whether the given solution contains carbohydrates or not. 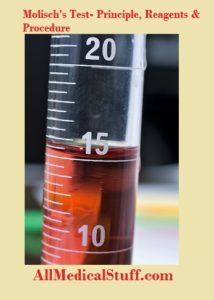 Take 5ml of solution in a test tube with the help of pipette. Add two to three drops of molisch reagent. Mix it gently for some time. Incline the test tube and slowly add a few drops of strong mineral acid. (Sulphuric acid or hydrochloric acid). You will observe reddish violet ring formed at the junction of the acid and carbohydrate solution. First of all the most important thing you need to know is to add acid at the side of test tube. Don’t add it directly. Then you would need to add acid drop by drop. Do not add all the acid once. Measure the solution before adding it. Add only few drops of molisch’s reagent. You don’t need to add much. Add acid with great care as we use strong acid in this test and it could burn your skin. Don’t shake the test tube when ring is formed. If you do so, you would destroy the ring. If you perform all the steps as mentioned above correctly, you would definitely get a positive result, i.e violet ring if carbohydrates are present in your solution. plz i have a question why purple ring is formed between two layers ……..and why we add acid slightly and through the side of tube?? When furfural is condensed it is in the form of colored compound and here in this experiment the colored compound is in the form of ring. And we add acid through the side of the tube so that both the solutions don’t mix and the ring is not disturbed. If you add the acid directly it will destroy the ring.If both the layers mix, the layer of reaction would be dispersed and the results would be not accurate. plz i have another question….and question is ….the ring is formed after adding acid due to dehydration or before?? Yes ring is formed after adding acid. This hydrolyze CHO and furfural is formaed. it then reacts with alpha nepthol which is already present in test tube. The two layers don’t mix because we add the acid slightly and condensation takes place only in the surface molecules, thus violet ring appears on the surface. The ring is formed between the layers of denser sulphuric acid and test sample of lower SG. I think the reason for adding the acid slowly through the sides is to avoid splashing of the corrosive acid. you could be right but if you don’t add acid slowly through the side then they layers are mixed and ring is not formed which means that both the layers should not be mixed. i was just wondering does this mean, if the layer of reaction disperses as you stated in the top question that we would get a negative result rather than a positive one. no that would could be your fault. if ring is formed and then damaged then it should be positive result. but if ring is not formed and you think you have done mistake (not adding acid to sides), you should repeat it again. sir i have a doubt what is the compound present in that purple ring?????? it is the condensed form of furfural. read the principle of molisch test above. Why does the ring disappear when the test tube is shaken and the whole solution changes color to purple? Because when the ring is formed at the junction, it means that the compound that is formed because of reaction is only there (at junction). But when you shake it, the compound is mixed in all the solution. what are the compounds other than carbohydrates that give this test? what are the carbohydrates that dont give this test? it is general test for carbohydrates and all carbohydrates either in free from or in combination with other compounds like glycolipids, glycoproteins etc will give positive molisch’s test. Question sir, when water is used as control, what color result? Sorry, don’t know about this. Water will yield a negative result in Molisch’s test. Nothing will actually happen to the water. Please sir, I have a question. My question is, Can Benedict’s test which is also a test for carbohydrates be used to test for diabetes? Give reasons. because this voilet ring is only formed if CHO is present in solution. sir, can you please tell me the general tests for carbohydrates, ‘cos i dont think Benedict’s test, iodine, fehling’s test, barfoed’s test and seliwanoff’s tests are general test for carbohydrates. Pls why do we boil in the bial’s test? I mean what is the significant of the boiling. sir, why there are also crystal formation in sample between the ring? Sir please, what is the role of sulphuric acid and what does the ring signify? sulfuric acid hydrolyses carbohydrates to simple sugars. The ring show that Carbs are present and this ring is only formed when furfural is condensed. Tnk u admin…pplz is molisch test a specific test for carbohydrates,with reasons? i just wanna to ask… i have done this experiment by using glucose, xylone, fructose, maltose and sucrose.. but the product different for each of one.. glucose, xylone and fructose have slightly same colour.. but sucrose and maltose have different than the other 3.. can you explain to me why this happen?? Theoretically all of the carbs should give positive results. Personally i have performed this test on only one sugar therefore, can’t say anything. I just performed this test and I’m looking for info. to make my report; insted of the ring in the junction of the solution, I obtained a purple precipitate, and that’s the result I was supposed to get., only my glucose solution formed a very thin purple ring on the surface (again, that result was expected by my professor), so my question is: in which conditions is the precipitate normal for the molisch test? in which conditions the positive result will be a ring? Thanks in advance and sorry for my bad English. ring would form with all the carbs….when the solutions turns purple and ring doesn’t form it means that you have mixed the two solutions…if you do it correctly and the two solutions doesn’t mix, you would definitely obtain a ring. Sir, you said the violet ring forms because of the aldehyde group present in the carbohydrate. Does it mean keto sugars don’t give a positive result since there’s no addition of an alkaline to convert the keto group to and aldehyde? sorry will answer this later or will update the post for you. don’t have experience about this but fructose should also give purple ring. Is it okay if we didn’t add sulphuric acid? What’s the name of the purple ring formed? Why the tube become hot when shaking/mixing? Why Molisch test considered as a general indicator for all types of sugar? Which type is the fastest to show the purple ring? 1. no sulphuric acid is must. 2. it is condensed form of furfural. 4. because it gives positive result with solution containing any type of sugar. 5. sorry, don’t know about any method which will speed up the reaction. Tell me about apparatus that used for molisch’s test????? mentioned in the post…but i will add a separate heading. Plz i have a question why monosaccharides gives a rapid positive test , disaccharides and polysaccharides react slower ? because disacchariedes and polysaccharides have long chains which takes time to break and react. condensation reaction in molisch’s test removes which chain?? results are mentioned above at the end of procedure. can’t we know the specific type of carbohydrate is present? no…for that there are other tests that you can study from our site…i have written about tests for all the individual carbohydrates. I have a question sir, why is it that in our experiment, glucose, ribose, and starch don’t have a formation of purple product? Why is a black ring formed sometimes at the junction of the two liquids instead of a purple one? clearly mentioned in the principle. sir, why moliisch’s test is called qualitative test ? what is the reason behind this ? the reason is mentioned above in the post if you have read carefully…it is called qualitative test because it tells you whether the solution contains carbohydrate or not. Sir I want to ask, why we must preserve the ring rather than observed that it has produce purple color?, isn’t it the same, because the purple color formed by the purple ring which is formed due to carbohydrate is presence in the solution, so if I shake the tube and the whole sample became purple, it’s still a positive result right? what i have learned is that the ring is diagnostic so you should focus on the ring. Sir, i did the test few days ago using several known sugar solution and one of the sugar solution was fructose. However, it gave out negative result. May i know the possible reason why this could happen? Thank you. fructose should give positive result…may be you did some mistake in the test.